Robert Kubica was tipped by most to be a future world champion but now looks unlikely to ever add to his solitary grand prix victory after a 2011 rally crash ended his F1 career. The accident robbed F1 of one of its most popular drivers, a man who was never quite given the machinery to match his talent. You only had to watch an on-board camera of Kubica around the streets of Monte Carlo to see he possessed a rare gift behind the wheel. His move to Renault in 2010 showed his talent and in 2011 expectations were high, but disaster struck in pre-season at an Italian rally event which nearly severed his right hand. He harboured hopes of a return to the sport but has recently admitted his injuries mean a return would be "nearly impossible". His career began in karting before he graduated to the Italian Formula Renault 2000 Eurocup in 2001. A move to the Formula 3 Euroseries followed in 2003, but it was not until title success in the Word Series by Renault in 2005 that Kubica really made a name for himself - earning a test with Renault. BMW Sauber signed him as test driver in 2006 and he made a successful grand prix debut in Hungary deputising for the injured Jacques Villeneuve who later left the team. Kubica went on to score a podium in Italy at just his third race in F1 and his first full season in 2007 saw him finish sixth in the championship. However, he was fortunate to escape serious injury in Montreal where he had a huge accident that forced him to sit out of the US Grand Prix a week later. He raised his game in 2008 and completely out-shone team-mate Nick Heidfeld, securing BMW Sauber's first race victory in Canada. Although he was a contender and at one point led the championship, the team opted to focus its resources on 2009 - much to Kubica's frustration - and he finished the championship fourth overall. His frustration was compounded when the F1.09 failed to match its competitors and time spent working on a failed KERS project detracted from development of the chassis. BMW then announced it was leaving the sport at the end of the season and put the Swiss-based team up for sale. 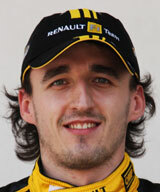 Kubica was left with few options and in the end joined Renault, even though the team was recovering from one of its worst seasons in years. Nevertheless, he immediately adapted to the atmosphere within the team and proved to be a natural replacement for Fernando Alonso. Midway through the season he signed a new two-year contract, although there were also rumours he had a Ferrari contract lined up. His accident put all that on hold, however, and in 2013 he finally made his return to racing in the European Rally Championship. His rallying commitments continue in 2014, with a return to F1 looking increasingly unlikely. On tracks where the driver can make the difference - such as Monaco and Spa Francorchamps - Kubica proves his worth. In the past he has lacked motivation when the team is not directly behind him, such as in 2009 at Sauber. His first and so far only victory in Montreal in 2008 - albeit following a controversial pit lane accident which eliminated Lewis Hamilton and Kimi Raikkonen. Being in the right place at the right time, he made best of the opportunity to record BMW Sauber's first and only grand prix victory. On the eve of the 2011 season he was badly injured in a minor rally event in Italy, ruling him out for the whole of the season. In 2013 he admitted his injuries make an F1 return highly unlikely. "I've never known it like this and it's difficult to know how damaging it's been, but this  has been one of the worst years for politics in F1. All I want to do is to be able to focus 100% on what I love, which is driving, and that's not been possible." "In my job I spend a lot of time with a lot of action, high speed and noise. By contrast, poker and bowling are quite steady." Outside of F1 Kubica's hobbies are snooker, poker and ten pin-bowling - his hero is snooker legend Ronnie O'Sullivan.